Lavender : This handmade soap combines pure olive oil with lavender extract and essential oil, which is relaxing, antibacterial, antifungal, soothing. Ideal for skin disorders, eczema, psoriasis, rashes. 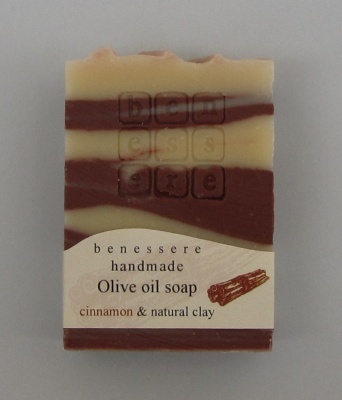 Handmade olive oil soap with essential oils Cinnamon, Clove, Eucalyptus, Rosemary and Orange. The spicy scent rejuvenates and stimulates the senses. The red clay delicately replenishes and heals tired skin cells. Ideal for dry, sensitive skins.